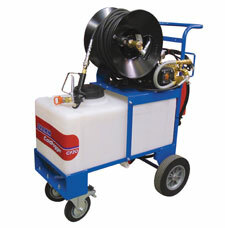 Manitowoc, WI- Dramm has updated its Coldfogger, Targeted Low Volume Sprayer to the new AR model. This version offers a more durable pump that is easier to use and allows for the use of corrosive chemistries. The NEW Coldfogger AR uses a piston pump as an upgrade over our previous diaphragm pump. This pump features corrosion resistant components and an easy to service design, making the unit more durable for professional greenhouse operations. With more and more corrosive and oxidizing chemicals being used in the greenhouse industry, this upgrade allows for targeted low volume application of these products. Many of the newer crops are limited in their pesticide use and corrosive products are a staple for disease control and disinfection. The NEW Coldfogger AR helps growers by allowing them to use their full arsenal. The NEW Coldfogger AR operates differently and does not require some of the machinations of the previous pump. Priming is easy as the unit uses a self-priming pump that is fed by the agitation pump with a precise pressure and flow. The NEW Coldfogger AR continues to be available in a 20 gallon model (80,000 square foot capacity) and allows for the introduction of a 50 gallon model (200,000 square foot capacity) with hose lengths up to 300 feet. For more information on the Coldfogger AR please contact Dramm or visit our website: www.dramm.com.